Are you ready to enjoy a straighter smile? At Hobbs Dentistry, our adult orthodontics options are ideal for a busy lifestyle. With the advantages of Invisalign® clear orthodontics and Six Months Braces®, your teeth can be straightened comfortably and efficiently in a short amount of time. Dr. Rebecca Hobbs is a certified dentist provider for Invisalign® and Six Month Braces®. Invisalign® is a patented orthodontic technology that straightens teeth with a series of removable clear plastic aligners. 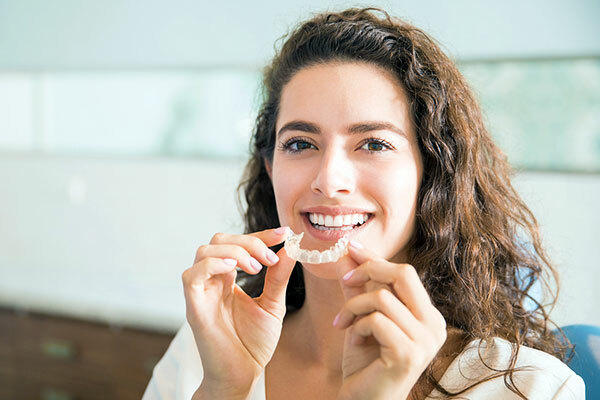 Invisalign® is very well suited for adults; the removable aligners make the orthodontic process practical and manageable during normal daily activities. After examining your teeth and talking with you about your goals, Dr. Hobbs works with the Invisalign® laboratory to determine the best path of teeth movement. The laboratory uses 3D technology to plot the course for your new smile; this also gives Dr. Hobbs the digital tools to show you the expected results on a computer screen. Your set of Invisalign® aligners is planned to work in sequence, with each aligner achieving calculated movement of the teeth. You visit our office every few weeks to replace your aligner as we monitor your progress. Most patients complete the Invisalign® process within 18 months. Invisalign® clear aligners fit snugly over the teeth, making them barely noticeable while speaking or smiling. And, you can just remove them to enjoy your favorite foods (instead of worrying about cleaning traditional metal braces). The cost of Invisalign® is very affordable. Hobbs Dentistry is a participating dentist provider for CareCredit® and Lending Club® healthcare financing; we have monthly payment plans available to fit any budget. Want to learn more about Invisalign®? Contact Hobbs Dentistry or visit Invisalign.com. Crowded, overlapped or overly spaced front teeth are easily straightened with today's orthodontics. Six Month Braces® is a proven technology that uses clear orthodontic brackets and thin arch wires to straighten teeth in as little as six months. Dr. Hobbs may recommend Six Month Braces® if you have concerns with the alignment of your front teeth. The Six Month Braces® orthodontic technology utilizes a special wire process to move teeth over time. Through consultation and planning, Dr. Hobbs and the Six Month Braces® laboratory technicians measure the amount of movement needed to straighten your teeth. This data is used to pre-shape an orthodontic wire that goes over the teeth. Science and technology allow the teeth move to conform to the wire position. By using clear brackets and an ultra-thin wire, Six Month Braces® does not detract from your overall smile appearance. Six Month Braces® is usually very focused on the front teeth, with less appointments and a lower cost than traditional full mouth orthodontics. Beautifully simple technology means you get to improve your smile in a short time without breaking your budget. If you have crowded or overlapped teeth, or have been told you have an underbite or overbite, you may be a candidate for adult orthodontics. The first step to your new smile is to schedule a complete dental examination and orthodontic evaluation with Augusta general and cosmetic dentists Dr. Rebecca Hobbs. Dr. Hobbs will consult with you and provide you with recommendations to straighten your teeth. Dr. Hobbs also works with local orthodontists; she may recommend a referral if your needs would be best addressed by a specialist. Contact Hobbs Dentistry of Augusta to schedule your complete dental examination and orthodontic consultation.